Governments made the commitment for keeping the increase in global average temperature to well below 2°C above pre-industrial levels. And even aiming to limit the increase to 1.5°C, since this would significantly reduce risks and the impacts of climate change. Next step for the EU member member states is to implement the Energy Union package and strategy 2030-2050 focused on a low carbon society. It may be expected that measures in buildings will be strengthened as they have the biggest potential to save energy and reach CO2 reduction drastically and are a stimulator of investment and business innovation. ES-SO calls upon the policy makers to put more attention on the need for more cooling in buildings due to climate change and the since EPBD adapted construction methods. Energy efficiency must remain priority first and passive cooling technologies among which shading are to be used before active cooling methods. In addition “free natural energy sources” coming from sun and wind becoming a standard in the concept of low energy buildings should be included as energy savings achieved from RES, renewable energy sources. Dynamic (moveable) shading solutions outside or inside to the window can be smartly managed into retracted or extended position to use these free energy sources for decreasing the risk of overheating and reducing the heating and lighting cost. Assotende, started its journey in 2013 and has become the reference point for the Italian companies that operate in the solar shading industry. It has a collaboration with FederlegnoArredo, representing the complex of industries active in the furniture manufacture. The Association for the Solar Shading Industry of Norway, Solskjermingsforbundet, took a significant growth in 2016 and has a strong focus on education and training for the profession. Both associations have become full member of ES-SO. Anwis, a leading company in exterior and interior shading took over the Polish membership as associated member. More info on our members. See on this link. The QUALICHeCK Project runs until end February 2017 and will provide for the EU authorities important guidelines and instruments useful for the EPBD review. ES-SO attended two events in Spring 2016, see link to presentations on our website. At both sessions ES-SO presented ES-SDA, the European solar shading database. Reliable uniform product data are key for both EPB regulators and industry when using energy efficiency measures in NZEB buildings. ES-SO is developing a unique European database of validated solar shading properties, based on third party verification and confirmed by a peer review procedure. In our next Newsletter the ES-SDA website with the first results will be published. More info on the pre-launching, see our website. 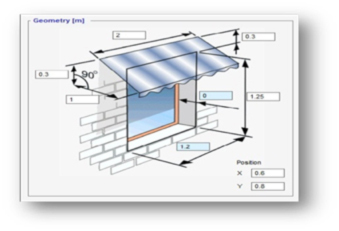 ESBO, the early stage building modelling tool where solar shading features are properly included. The tool is developed by EQUA (www.equa.se) , a Swedish company specialised in building modelling IDA ICE. Unique in this collaboration is the agreement of ES-SDA and EQUA that shading properties materials both included on the ESBO and ES-SDA database will be mentioned as ES-SDA validated on ESBO. More info to follow in the REHVA Clima 2016 Report.